On the way to Girnar Hill, one will see a huge white colour building that houses fourteen edicts of Emperor Ashoka. The edicts are dating back to 250 BC and were re-discovered by James Todd. 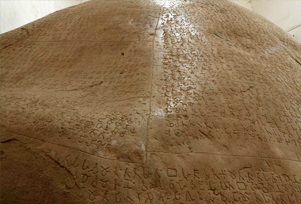 Edicts exhibited in the building are carved out of large granite stones with inscriptions written on it in ancient languages like Pali and Brahmi. Inscriptions on the stones tell about the philosophy of Ashok-respect for all religions, developing a positive attitude, kindness to everyone and resistance to greed and animal sacrifice. On the top of Girnar hill, one can notice a large black coloured granite slab that has major rock edicts written by Ashok. Edicts also show the life history of King Ashok, how he gave up war and violence and became a firm follower of Buddhism. All the edicts have a strong historical connection and they all impart the message of peace, tolerance and communal harmony. Edicts are the proof that the people of the area were once under the influence of Buddhism. For all the history buff, this is an important place to visit.